“Inspirations and Influences” is a new series of articles in which we invite authors to write guest posts talking about their…well, Inspirations and Influences. The cool thing is that the writers are given free reign so they can go wild and write about anything they want. It can be about their new book, series or about their career as a whole. There are plenty of things that show up in In for a Penny that I love wholeheartedly: making lists, men who speak foreign languages, and ballads about girls who run away to sea, for example. But the influences at the heart of the book are all things that make me angry, and matter to me a lot. 1. A Civil Contract, by Georgette Heyer. I adore Georgette Heyer. I envy her prose style to the soles of my shoes. And A Civil Contract makes me want to throw it at the wall every time I read it. It’s about a penniless lord who marries the daughter of a self-made man for her money. Jenny is “too commonplace and matter-of-fact to inspire…passionate adoration,” unlike the woman Adam loves, a high-strung aristocratic girl with beautiful eyes. So far, so good. Except at the end of the book, Jenny’s in love with Adam and he is still not in love with her. Instead, they discover that a marriage of quiet content can be more enduring than passion. I’m not opposed to that sentiment, and I know a lot of readers love the book for that very reason. But why Jenny? Why is Jenny denied what every other Heyer heroine gets: the passionate adoration of her hero? What if , I thought, I wrote a marriage of convenience between a penniless lord and the daughter of a self-made man where he’s the one who feels inadequate, and she’s the one with the ex-boyfriend? 2. Jane Austen, especially Sense and Sensibility. Jane Austen is another writer who remains a huge influence not just on me, but on the entire romance genre. She writes the best comedy of manners ever. She does amazing banter. She writes strong female characters (mostly) and charming heroes (mostly). And yet, Sense and Sensibility makes me angry. Jane Austen sets up her world so that a girl can be an Elinor, and be sensible and level-headed and live up to her responsibilities, or be a Marianne and be enthusiastic and talkative and willing to take emotional risks. By dividing those traits up into two characters and then making Marianne silly and kind of obnoxious, Austen says that you can’t be both. 3. Trying to be taken seriously. I think we’ve all had the experience of not being taken seriously, of being treated like someone whose thoughts don’t actually count for whatever reason. It’s an awful feeling. Penelope’s whole life has been shaped by that feeling. Her nouveau-riche parents started out as working-class Londoners, but they sent their daughter to a finishing school for young ladies. The other girls all made fun of her–for the way she ate, the way she talked, the way she dressed. So she watched everything she did, trying to prove that she wasn’t vulgar, that a working-class girl could be just as good as the daughters of lords. That’s something I haven’t experienced personally, of course. But I drew on personal experiences and family history to help me figure out how to write about it. As a teenager I struggled to present my opinions in a level-headed manner, so that my dad would take me seriously. (Alas, I frequently ended up crying in the bathroom and/or yelling…) As a girl majoring in math in college, I tried to seem confident and smart, and always wore my most serious clothes to seminar. There were whole years of my life when I wouldn’t wear pink. And I love pink! 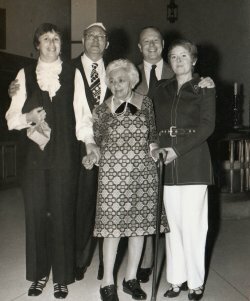 My grandmother (whose parents came to the U.S. from Poland) made the transition from being very poor as a child to being middle-class as an adult. 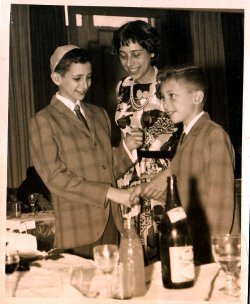 She remembered showing up to her first day of school speaking only Yiddish, so she didn’t teach her children Yiddish at all. She was very proud of her education. She tried not to speak with a Brooklyn accent. She wanted my mother to be a doctor even though my mother was one of the most squeamish people I’ve ever met. Don’t get me wrong, my grandmother loved her family and was proud of where she came from. And she really did like opera, it wasn’t just an affectation. But she also censored herself and her kids, and had some bizarre blind spots. 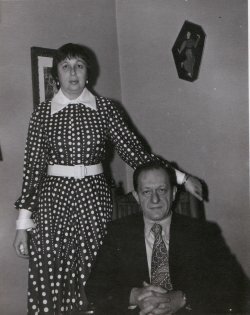 For example, she believed that she had a more classy taste in clothes than her own mother, and was always complaining that my mother looked schleppy and giving her fashion advice. Let’s look at some family photos. Clearly bright, busy patterns run in the family. Is that because we’re peasants at heart? Maybe, maybe not–but who cares? Of course, I can say that. I can really not care, because I don’t have to prove anything to anyone. My grandmother did. I tried to show that with Penelope. I tried to show that she’s playing a losing game, but at the same time I didn’t want to criticize her for playing. Because in her situation, I think it’s impossible not to want approval, and not to feel like you should be a credit to where you came from. So there you have it, three of my inspirations and influences! Thanks Book Smugglers for having me! About the author: I discovered Georgette Heyer when I was thirteen, and wrote my first historical romance a few years later. My writing has improved since then, but my fascination with all things Regency hasn’t changed. When not reading, writing, or researching, I enjoy cooking and marathoning old TV shows. I live in Seattle with two roommates, four cats, and too many books and DVDs to count. You can learn more about the author on her website, where you can find an awesome excerpt of the book, cool characters’ interviews and a contest to win not only her book but also a package of 10 of her favorite Regency-themed books. No more drinking. No more gambling. And definitely no more mistress. Now that he’s inherited a mountain of debts and responsibility, Lord Nevinstoke has no choice but to start acting respectable. Especially if he wants to find a wife-better yet, a rich wife. Penelope Brown, a manufacturing heiress, seems the perfect choice. She’s pretty, rational, ladylike, and looking for a marriage based on companionship and mutual esteem. But when they actually get to Nev’s family estate, all the respectability and reason in the world won’t be enough to deal with tenants on the edge of revolt, a menacing neighbor, and Nev’s family’s propensity for scandal. Overwhelmed but determined to set things right, Nev and Penelope have no one to turn to but each other. And to their surprise, that just might be enough. We have one signed copy of In For A Penny to giveaway. In order to enter, leave a comment on this post. Contest is open for residents of US and Canada ONLY and will run till Saturday February 20th 11:59pm (PST). We will announce the winner next Sunday in our weekly stash! Good luck! Interesting take on A Civil Contract. I just recently listened to it on audio and it struck me how really horrible Adam’s thoughts are about Jenny. Something I had not really noticed before and which I had been able to ignore when I read the book on paper. That sounds really interesting- I’d love to have a copy! 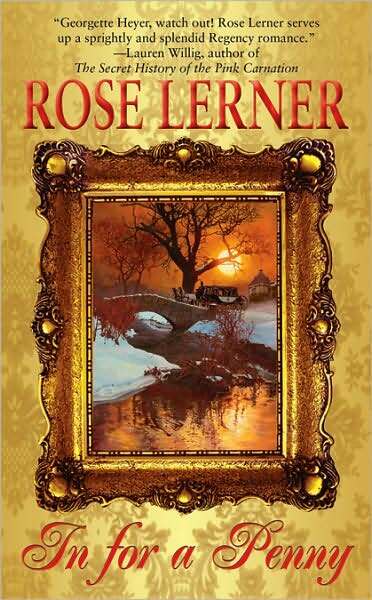 I haven’t read Heyer’s A Civil Contract, but I’m intrigued by Lerner’s reaction to it, and I’m also super intrigued by Ana’s review of In For a Penny. Historicals haven’t been doing it for me lately but I’m on the lookout for that to change. Please count me in for the giveaway! It’s been awhile since I’ve read a historical, but this one sounds interesting. Enter me, please! 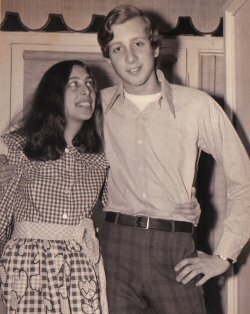 wow, thanks for sharing the photos of your family, each one is like a tiny time capsule of fashion! Ana’s review brought up so many things from In For a Penny that i love in romance novels and as a long time fan of historical romance i too have been feeling a bit of a draught, so id love to be entered! I’m probably one of the few who have not read any of Georgette Heyer’s work. In For a Penny sounds like a wonderful story. A romance loosely based on your Grandmother/Great Grandmother’s experiences would be a wonder as well. The history alone would be amazing. Congrats on your release! I have to admit I havent read Georgette Heyer’s Civil Contract. I believe that like you I would shock and annoyed at how the heroine got the raw end of the deal. Your novel sounds like a good read. Would love to be entered to win. In for a Penny sounds great. I love marriages of convenience in romances. Cybercliper, you are not alone in you nonreading of Heyer but I do have one of her novels on hold at my library so I can participate in a readalong. I am adding In for a Penny to my wishlist just in case I don’t win in this lovely contest! I’m not usually one for historical romance, but this one sounds sweet! Great column. Your book is a definite add to my TBR list. Thanks. Thanks for sharing this book! It looks great. I haven’t read that many historical romances but I really liked reading about Rose’s influences, and Ana’s review of In for a Penny makes me think I’d really enjoy it. OK, I have to read this one! Thanks to all of you for doing these author interviews. I had scrolled right over In for a Penny until I read this. Now I can’t wait to read it, even if I don’t win a copy. GrowlyCub–I think the scenes that annoyed me the most were the ones with Adam and Jenny’s FATHER. His own mother is so shallow and selfish, why would he judge someone else’s loving and devoted parent because…the guy raises his voice when he’s angry? 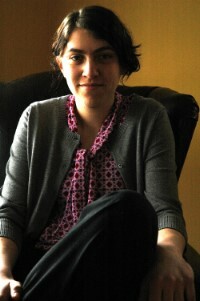 Lustyreader–I felt a little bad because for some reason those photos were also all the MOST UNFLATTERING ones! My family is actually pretty good-looking (if I do say so myself) but somehow in all the pictures with the polka-dots and the stripes and the polka-dotted stripes, everyone just looks AWFUL! But the photos were so amazing I couldn’t resist–I’m glad you enjoyed them. 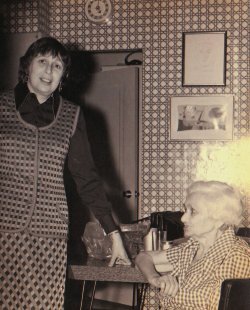 I think my favorite is the one of my grandmother with her mother, and they almost match the kitchen wallpaper. Cybercliperon–if you do want to start reading Heyer, I’d recommend starting with the Grand Sophy. It’s one of her best, IMO, and one of her strongest heroines. I’ve had pretty good luck loaning it to non-Heyer fans (unlike my other favorite, The Black Moth, which several of my friends have found boring, much to my dismay). However, every time I read A Civil Contract I’m left with a bittersweetness because I want Jenny to feel the rapture and devotion of being loved for herself. I think Ms. Lerner makes valid points that explain that feeling. I look forward to reading her debut because her responses are thoughtful and her focus on the “sense” heroine. I haven’t read a fabulous historical romance in ages. I’m going to have to add this to my wishlist so I can read it even if I don’t win. Thanks for a great interview & a great review! Really looking forward to reading this one! Thanks for the post. the scenes with Jenny’s father don’t annoy me. I can feel for Adam because his father-in-law is indeed not genteel. What I can’t forgive after the audio version is the scene where Adam expresses revulsion to himself when he looks at Jenny. That’s just a bit much. I never noticed it in many, many re-reads, but when somebody else reads it to you you cannot escape things like that. I was an ear-opening experience! Except for one (April Lady) I came out of hearing Heyer’s books read liking them strikingly less than I did before (partly an issue of selection – the ones available at our library weren’t exactly my favorites – and partly due to the ‘cannot escape the words in audio’ issue. The ones most affected were Cotillion (which I didn’t care for much before) and Regency Buck (which I remember liking quite a bit). Frederica was a neutral experience. This book sounds great. It’s good to see a new historical on the market!!! I had already put this one on my wish list based on the review. It looks wonderful. I’m already in love with any author that says her inspiration comes from Georgette Heyer! I’m sure this one will be a winner too. When I read the review yesterday, I immediately thought of A Civil Contract. It also reminded me of a Mary Balogh plot, but I couldn’t tell you which one. It sounds like a good read. The book sounds like something I would like. 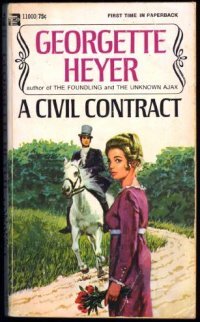 I have read and enjoyed a bunch of Georgette Heyer’s books but have never read A Civil Contract. Loved the photos! I think a lot of women try to live up to what is expected of them rather than be who they really are. Great concept for a plot. I’ve become a bit disenchanted with Historical Romance, but this sounds like just the thing to end my slump. Thanks for the review and the giveaway! Book Boor–I love sensible heroines too! I just wish we could appreciate both sensible heroines and whimsical ones without making it into a competition between them, if that makes sense. Have you read–I think it’s The Quiet Gentleman? There are a couple Heyers I can never keep straight and that’s one of them, but I remember the heroine is named Drusilla–anyway, she’s a lot like Jenny but she DOES get her true love in the end. I just never understood why Jenny couldn’t, if it wasn’t because of her class. Anyway, if you love sensible heroines I think you’ll like Penelope–if you do read the book, let me know what you think! GrowlyCub–What in Cotillion bothered you? I’ve been wanting to reread it because it’s a favorite with so many of my friends, but when I read it in high school I was very upset by the way the narrative treated the developmentally disabled character and I’ve never quite been able to move past it. Do you think I shouldn’t bother trying? Angelique–I agree! It’s interesting that you put it that way–a couple of years ago my critique group was talking about our “core stories,” and my critique partner said she thought mine was “being true to yourself and learning to be who you really are.” Which just speaks to me so much–one of my favorite things to see in a romance is a protagonist setting aside who they thought they were supposed to be, or who they used to want to be, and figuring out how to be themselves–and of course, finding the person that makes that possible for them! And to everyone else–thank you! You’re making me blush. Rose, for those for whom Cotillion works it works well and seemingly perpetually. I never liked it much to start with. Again, with the audio the early descriptions of Freddy were rather in your face negative. And I had a hard time overlooking that and identifying him as the hero later. I can’t tell you whether or not you should try again. 🙂 For all I know you’ll love it (again)! So many of my friends do. As negative as I made it sound I enjoyed all the readings, but I just noticed things I hadn’t before while reading myself. This Book Sounds Really Good. I Like Books In Historic Times. I Am A Huge Jane Austin Fan So It Is Kool That Rose Lerner Was Influenced By Her. I Would Love To Be Entered Into This Giveaway. Great post! You’re book sounds fantastic–I love Historical Romance! I love your take on the marriage of convenience. But that’s an author’s job, to take an idea and twist it around to make it as unexpected and satisfying as possible. I, too, have loved every single Georgette Heyer I’ve read – even the more historical ones like Simon Coldheart. Congratulations! I’d love to read your book. Austen and Heyer – two of my all time favorites! If your new novel is written in the same vein as those grand dames of romance fiction, then your book is sure to be great! I love historical romance and JUST placed a Heyer book on my tbr list after hearing of her for the fist time on a blog. I’d love to win In for a Penny. Nice to read your insights, Rose. I’m always looking for new historical authors, and marriage of convenience stories are favorites. After reading the review and bits of excerpts, sounds like it’s definitely for me. When Nev had discovered he could do it to himself the summer he turned twelve, he had spent nearly three days in his room with the door locked. Okay, I love this hero already. And I want this book. I <3 the inspirations behind IN FOR A PENNY IN FOR A POUND Rose. Yay for the "companion" bride finding passion and true love! Those photographs and stories about your grandmother were wonderful to read as well; kind of reminds me of my own maternal grandmother with all her peculiar rules. Woops – IN FOR A PENNY. Darn it. Looks like my first comment didn’t get recorded. All right – originally wrote how much I loved the inspirations behind IN FOR A PENNY (only I mis-wrote the title). BLARGH! Your book sounds wonderful, Rose, and I love that your writing it to both honor and amend what’s frustrated you as a reader in the genre. Hugs and best of luck from a fellow Dorchester author. I love this theme! Please enter me, as the book sounds great! I would love a chance to read this fine story. Loved the write up and Historical is fun. Sounds very interesting. I would really enjoy reading it. Please enter me. Thanks! Oh my goodness, this book sounds *amazing* hopefully I can still squeeze in at the last..second…? I was already interested in the book because of the review, and that list of influences clinched the deal. I love Heyer and am collecting her novels, one by one. A Civil Contract has moved up the list. Thanks, and I look forward to reading In for a Penny. I am clearly too late for the contest–but I still wanted to say “great post!” Best of luck for your book release. It sounds fabulous. *chimes in with ‘Great post’* I was always an Elinor girl, and burningly indignant about Jenny, too. 😀 Those photos are hilarious! 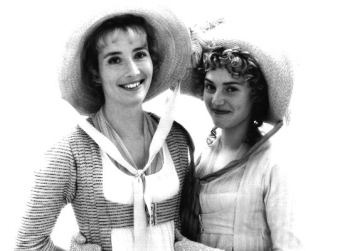 Sense and Sensibility has never been my favorite Austen, and I think you may’ve hit on why. Elinor is so staid. It’s good to know she’ll be provided for, but her HEA seems less somehow. Just stopping by to check out later comments. Aw, thanks everyone! I had a really great time. I’m glad you liked the photos. Sarah–Thanks! And allow me to take a moment to fangirl you–I loved Demon’s Lexicon! Mary–For me, I guess it’s not so much that Elinor is too staid, as that she’s set up in opposition to Marianne as “the right kind of girl.” I think the appeal of that is that a lot of us have heard a lot of people tell us that actually, Marianne is the “right kind of girl” and we don’t fit that. But I’ve spent a lot of time in my life trying to be the right kind of girl, and not enough time just trying to be me, you know? Wanting to see girls who aren’t like me get their comeuppance just leads to me ignoring and disliking the things about myself I hold in common with them, if that makes any sense. A little bit of synchronicity as I was trying to remember the name of A Civil Contract yesterday but it alluded me and here you are. I live in Australia and have just put a hold on your book for when it in comes into our state. (We can borrow state wide which gives a vast choice of titles). As for your family photos, on first glance I thought you were Indian, there you go. Oh and I am not sure how I came accross this site as I was looking up books and articles on Penelope and weaving as narrative.